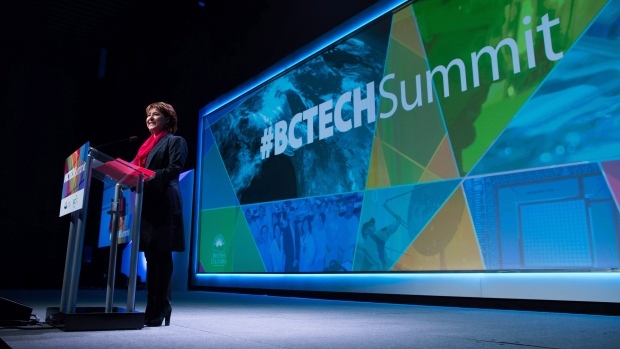 The BC Tech Summit?wrapped up recently in Vancouver, and the biggest news to come out of the two-day event was Premiere Clark’s unveiling of BC’s tech strategy. 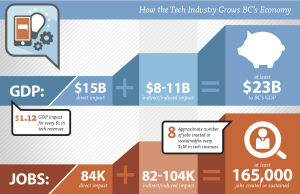 It is no secret that the tech industry in BC is flourishing. The sector is one of the highest GDP generators of all industries in BC, contributing $15.5 billion to our provincial economy in 2014. Tech employs 84,000 people in our province, providing high-paying jobs, and accounting for double the total jobs in forestry, oil, gas and mining. It seems that the BC government has now recognized the potential of this industry and has announced significant support to help it grow. It’s not clear if this interest in tech is a way to divert attention from the long-promised and as-yet unrealized LNG boom.? Nonetheless, the tech sector needs supportive policies in order to catch up with other provinces and countries, like our neighbours to the south.? CRED’s tech report recognized that BC falls behind other jurisdictions in terms of output , but the potential is great. If BC’s tech sector were to catch up to the average US state, we would see 65,000-74,000 more jobs and an additional $9.1 billion in GDP. In her announcement, Clark said that the BC government heard our concerns and has recognized three main issues: developing the talent pool, access to capital, and access to new markets. This makes us smile, as our report recognized a need for strategic government support, increased access to venture capital, investment in talent development and reduced barriers to recruitment. Right on! The only missing piece we identified is the support for regional tech hubs, but hopefully that can come soon too. ?1. ?$100 million BC Tech Fund to address an early stage (A-Round) funding gap. The fund is targeted at new and emerging tech companies that need resources to get off the ground. The province is seeking a private sector fund manager to administer it. 2. Introduction of IT skills & concepts, and adding coding to the K-12 public school curriculum beginning this September. Further details on implementation or teacher education have not been announced, and no new funding has been allocated. 3. Streamlining public sector access to software innovation through developer exchange? It’s fitting that this announcement comes just days after BC announced its opposition to the proposed Trans Mountain Pipeline project. While more details are still to be revealed, we feel it is a good start and a much-needed bolster to the tech industry. It’s also a good indication of where BC’s economy should be headed – away from higher-risk, shrinking asset industries and towards the future in knowledge-based, value-added economic activity.